"Mum, your charcoal Swiss roll is the BEST!" said my son emphasizing the word, BEST so loudly and continued to munch on the rest of his charcoal Swiss roll with a big wide smile. I laughed because my son was looking so cute with a cream mustache and his bo gay* smile. Bo gay? It means toothless in our Hokkien dialect. Bo gay because it was a smile that looked like there is "missing teeth" with specks of black cake crumbs that sticking onto his teeth. I laughed because we are happy. 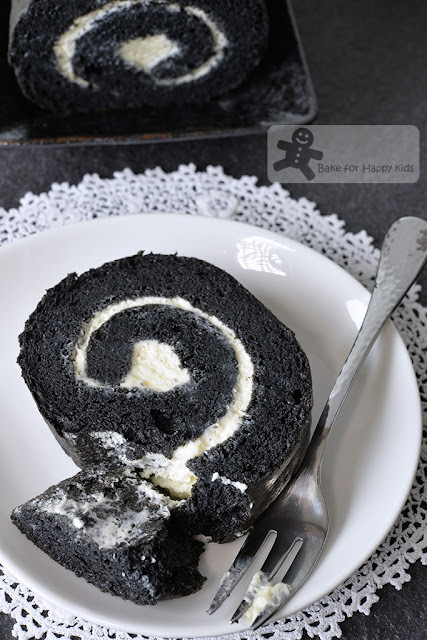 Happy that I have baked and enjoyed eating this beautiful and cottony soft charcoal Swiss roll cake. This is an awesome recipe and I hope that you will be happy after baking and enjoying this cake too. Want to see how I baked my cake... It's easy! 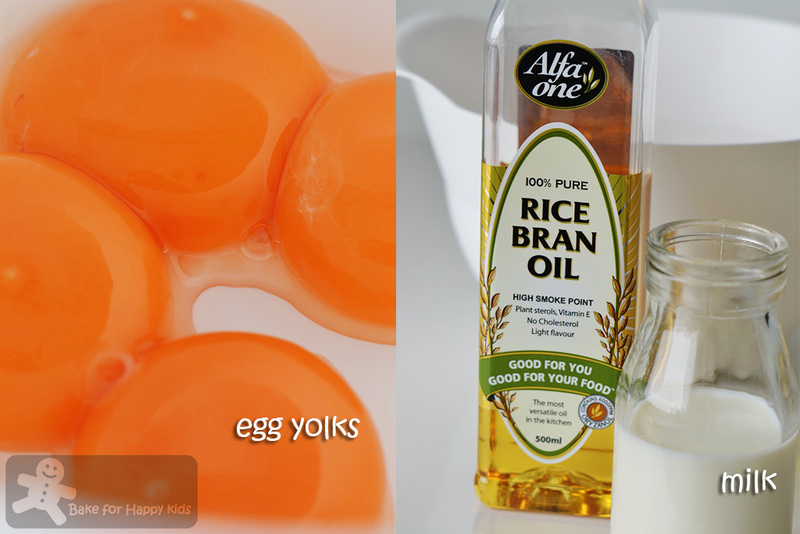 First I separated the eggs into yolks and whites and add oil and milk into the yolks. And whisk until just combined. Charcoal powder? For those who don't know... Accordingly to Wikipedia, bamboo charcoal is made by burning bamboo that are five years or older in an 800-1200°C oven. 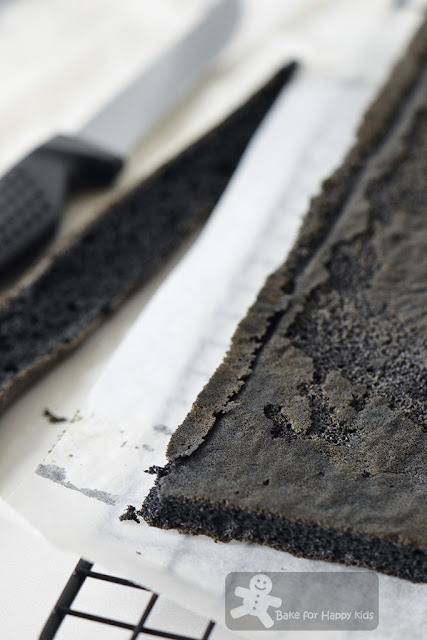 The Asians believe that bamboo charcoal has excellent absorption properties like removing bad odour and organic impurities and use it as an ingredient for cooking and baking too. Where can you buy edible bamboo charcoal powder? It is available in most baking supply shops in Asia. Or you can buy it via online shops like eBay and Amazon. Next, beat egg whites until stiff peak form. Combine both egg yolk and white mixture. 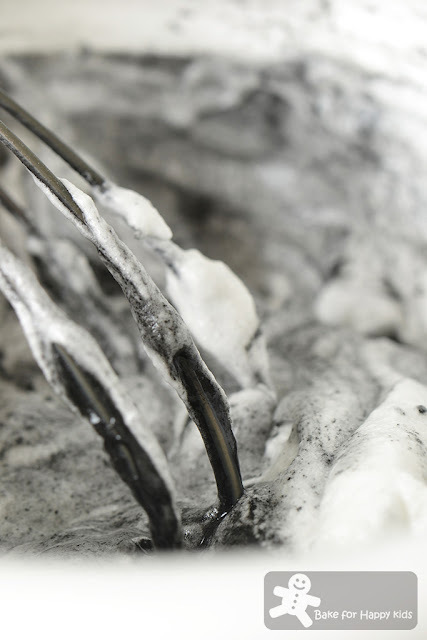 Pour batter into a large tray and bake. After the cake has cooled completely, trim off the sides of the cake. While the cake is cooling, I did this. Spread a thin layer of cream evenly on the cake. Roll the cake from the shorter end along the longer side to form a Swiss roll like this. Wrap in cling wrap and allow it to firm up into its shape in the fridge for 2-3 hr. It's teatime for "bo gays"!!! Yay!!! LOL! It is so soft and yummy! This is why my son and I were laughing and happy! Here's the recipe that is mostly adapted from here. * It is available in most baking supply shops in Asia. Or you can buy it via online shops like eBay and Amazon. 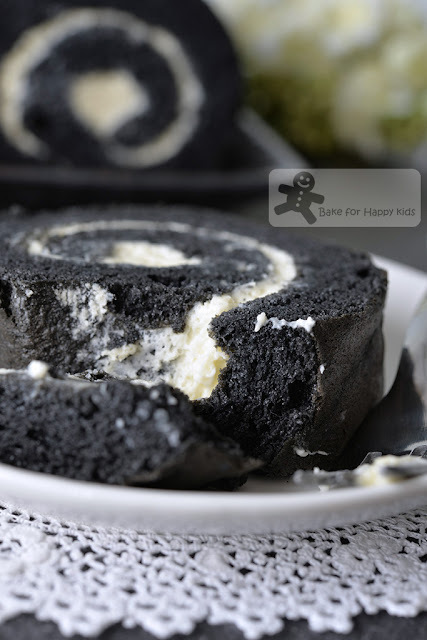 If charcoal powder is unavailable, you can replace with 10g cornflour to make a plain Swiss roll. Line one 35 x 25 cm baking tray with baking paper. Combine all in B. Sift mixture B into mixture A and use a hand whisk to mix until well incorporated. 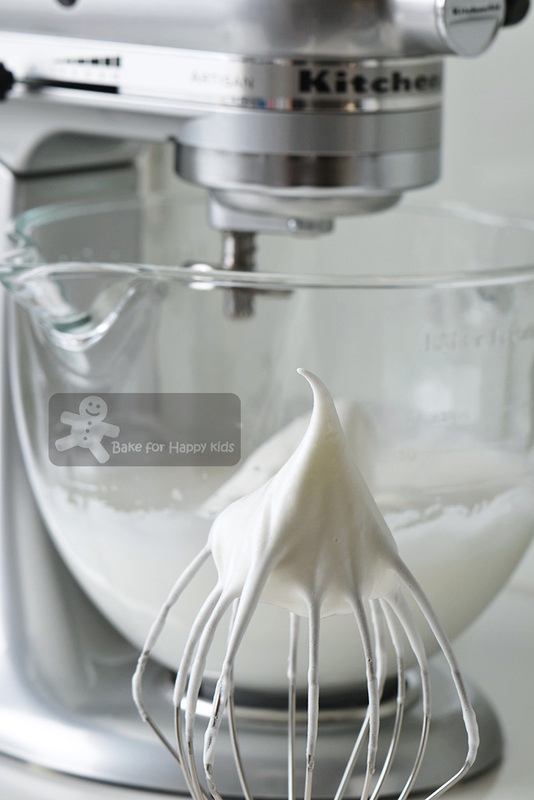 Using an electric mixer with a whisk attachment, beat egg whites in low speed until foamy. Increase beating speed to medium - Avoid using high speed as it will form large bubbles. 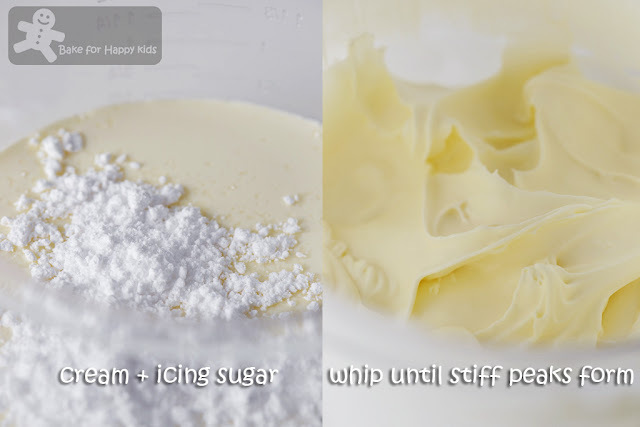 While beating, add sugar gradually and continue to beat until stiff peaks form. While the cake is cooling, use an electric mixer with a whisk attachment or a cream whipper to whip cream and icing sugar until stiff peaks form. 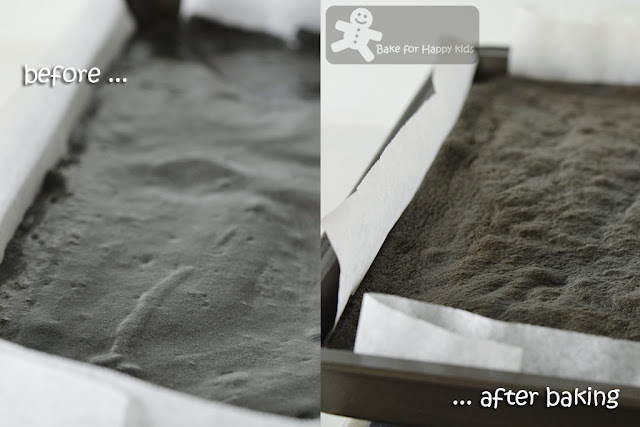 Place cake with its flawless (you can choose which side to use if both sides of your cake look good) side down on a clean baking paper. 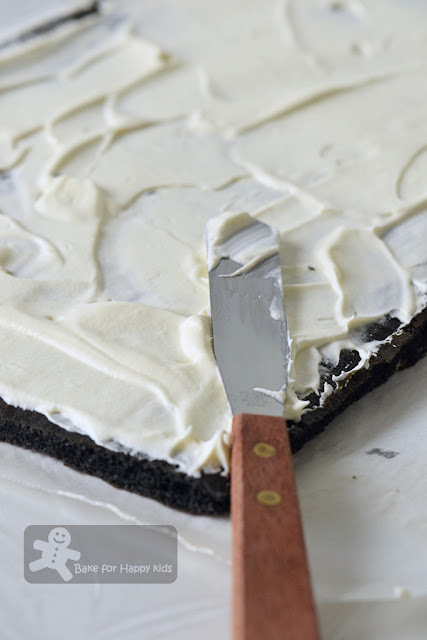 Use a knife to trim off about 0.5 cm from all the sides of the cake. Spread thin layer of cream evenly on the cake. Roll the cake from the shorter end along the longer side to form a Swiss roll. Wrap in cling wrap and allow the cake to firm up into its shape for 2-3 hr in a fridge or until firm enough to slice. Slice and enjoy the cake. Store uneaten cake in an airtight container and in a fridge for up to 3 days. I wanna try this! But very afraid i will crack the cake while rolling. Any tips?? Hi Zoe, thank you for the great recipe, my 1st time rolling a swiss roll & a success! It's indeed v fluffy & soft! My son loves it too! Please share with us more swiss roll recipes. Any red velvet? Love it! Gorgeous! I recently have eaten a couple gorgeous light, fluffy and tasty swiss rolls from bread talk. 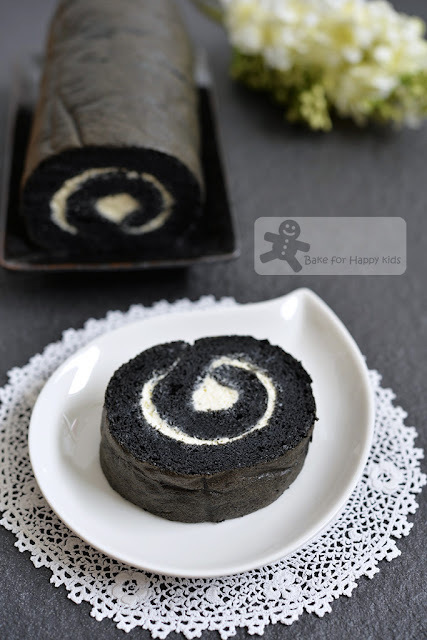 I love their hokkaido snow roll and chocolate roll and would love to try more swiss type rolls as I rarely eat them favoring the denser types of cakes. 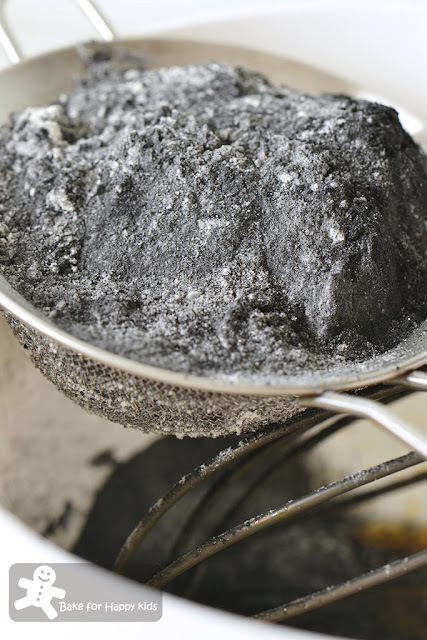 I've never used charcoal powder. Sounds SO interesting. 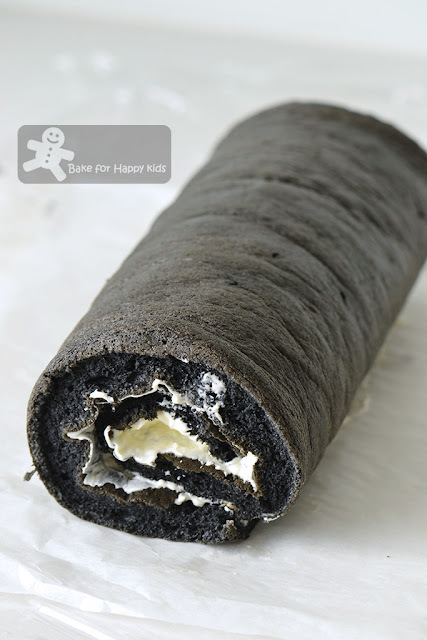 And this Swiss roll looks wonderful! Pretty black beauty .... so soft & yummy. Enjoy! Can i use topping cream instead of whipping cream? If so, do I omit the sugar? Thks for sharing! My answer is depending on the topping cream that you used. It has to contain 35% fat and any cream with lesser this amount will melt and change the cake to soggy. can you make a copycat recipe of Polar Puffs and Cakes strawberry swiss roll please!!!! I would love to if I have time :) Thanks for giving me these lovely idea. Hi Zoe! I was thinking to replace the 10g bamboo charcoal with matcha/pandan powder. I'm not sure if 10g is too much cos usually to bake an 8", usually only require less than 10g matcha/pandan powder. What measurement would you recommend to replace? Hi, I'm not 100% sure if the direct replacement will work as I have not try baking matcha Swiss roll yet. And, I don't bake my Swiss with 8" pan too. So sorry that I can't give you a definite answer. Just love how you stress the importance of weight measurements. Cant go wrong.